From the brilliant, or insane, people who brought us The Melancholy of Suzumiya Haruhi comes a... well outright pointless anime. Which is simply to say that it has no actual plot, or storyline. It's just short, rather random sketches usually about daily life for these "chibified" high schoolers. Sort of reminiscent of Azumanga Daioh, but I'll emphasize that this has even less actual storyline than that. While it may not have story what it has is comedy, and a lot of it, well, that and a lot of inside jokes that would be easy to miss. However the fansub group Lucky Channel has done a wonderful job adding in notes about certain things, so you don't have to worry about not understanding all of them. 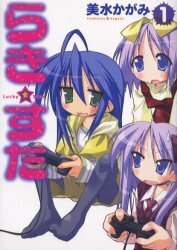 Oh man, I almost forgot about Lucky Channel. Whenever a part gets too boring and I start getting sleepy, Akira's shrill voice always wakes me up. I liked when she tells Shiraishi that he's starting to sit farther from her, and when he tries to move his chair closer to her she moves away anyway. I wish I could get my hands on the magazine that serializes this. Maybe I'll just wait until they're compiled into books.. I dont like this show.